If there’s one dish Malaysians look forward to during Chinese New Year, it’s got to be yee sang. 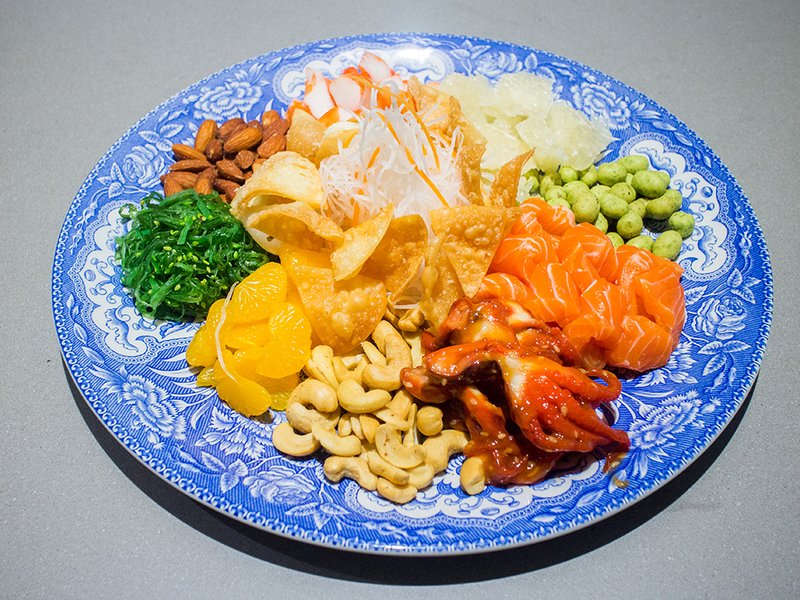 Also known as yusheng or lo hei, it features a mix of opposing colours, flavours and textures – crunchy, soft, sweet, sour, fresh, fried, green, red. Despite this clash, every ingredient in a plate of yee sang has a specific purpose. Fish, for example, symbolizes abundance, while carrots represent blessings of good luck. 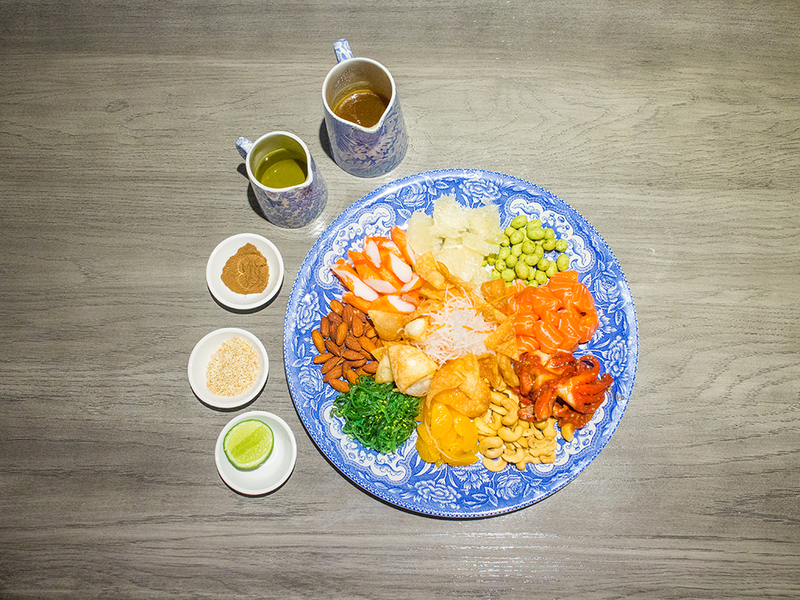 The classic yee sang was popularised in Malaysia in the 1960s and typically includes crackers, white radish, carrots, Chinese parsley, plum sauce, five spice powder, ginger, crushed peanuts and salmon sashimi or jellyfish to name a few. 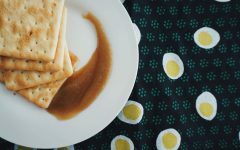 These past few years, however, this classic dish has undergone a revolution as restaurants reinterpret it to set themselves apart from the competition. 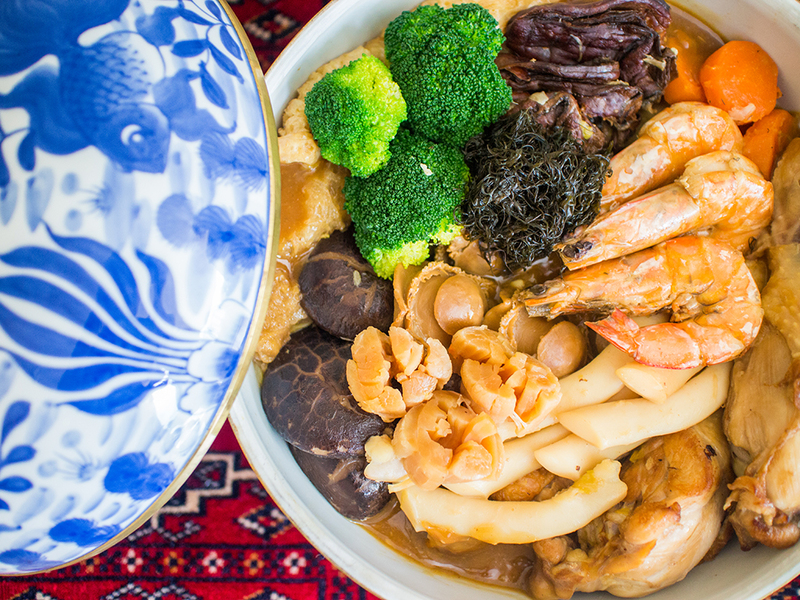 From snow pears to murukku to seaweed, Malaysians are pushing the boundaries of this communal dish. Readily available at a variety of restaurants during Chinese New Year, yee sang is rarely made from scratch at home. 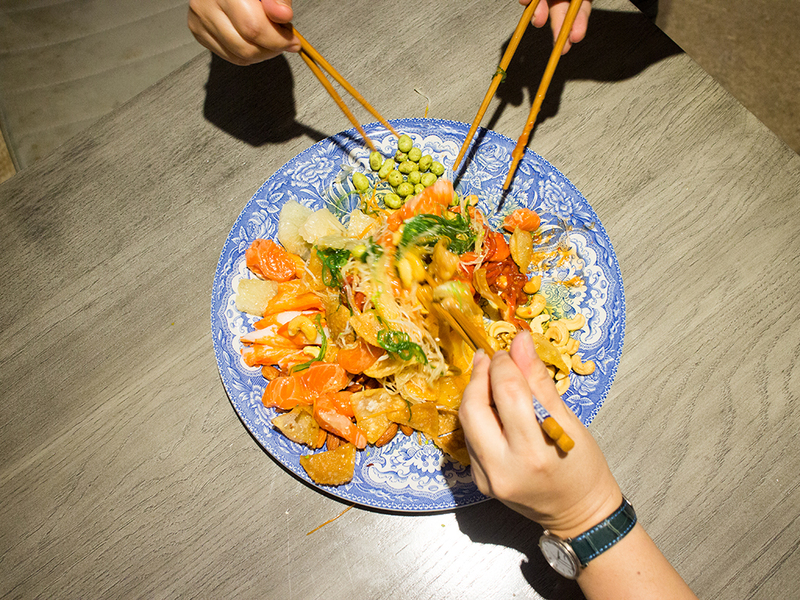 The list of ingredients can be daunting to prepare, so we resort to takeaways or pre-packed supermarket yee sang. But what if we’ve got a solution to all your yee sang woes? All it requires is a trip to a supermarket and maybe a Japanese restaurant. In fact, more than half the ingredients are readymade, but when put together don’t be surprised if you absolutely blow your guests away. 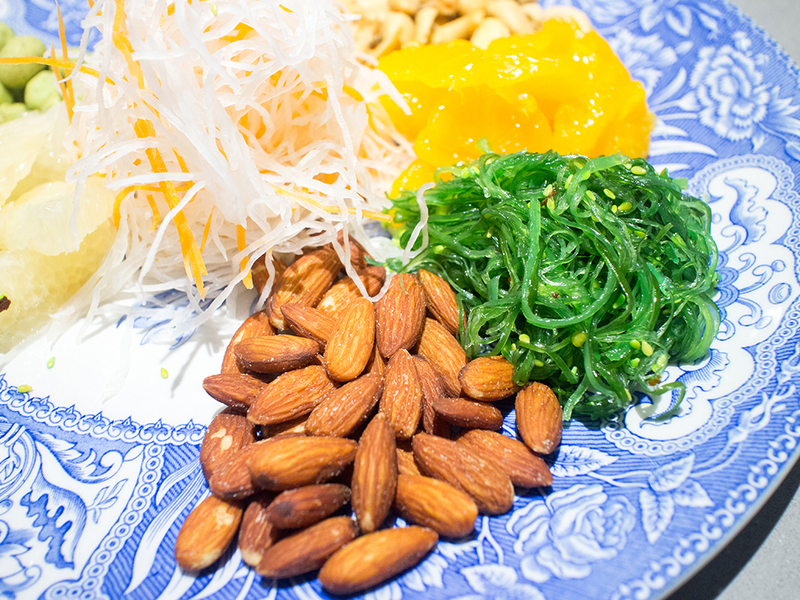 Our recipe for this Japanese inspired yee sang is different but familiar. And we promise, not only does it look impressive on a plate, it tastes incredible too. It’s so good we’re positive it’ll impress your mother-in-law and those critical aunties. 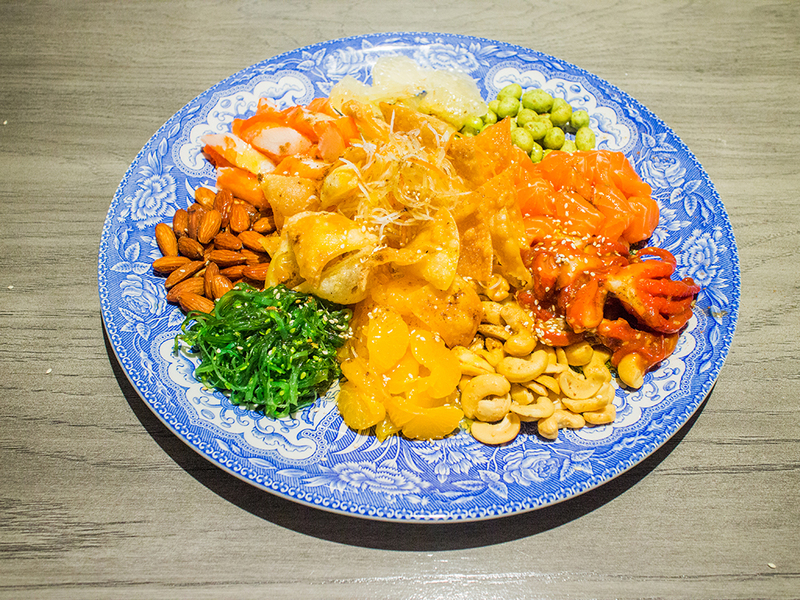 Come on, let’s lo hei away! You’ve got no time to waste! 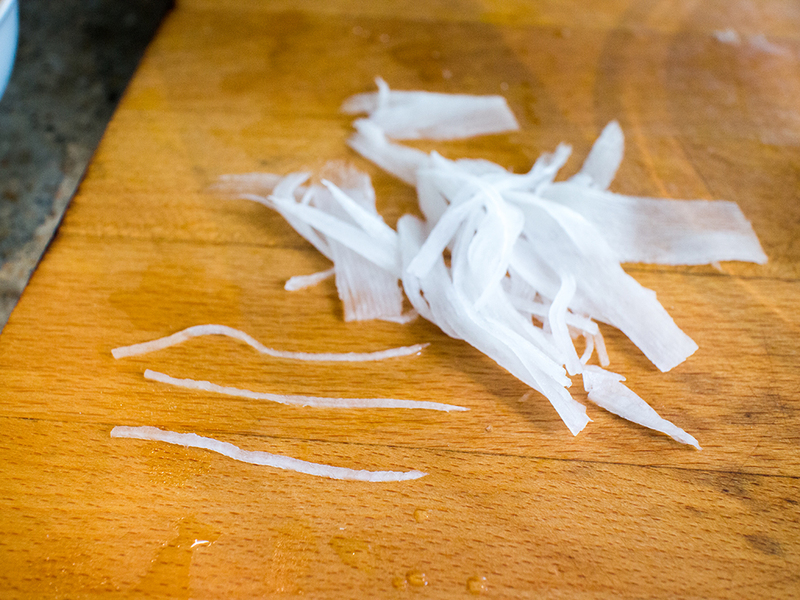 Peel daikon radish and chop off both ends. Do the same with the carrots. Prepare an iced water bath in a large bowl. 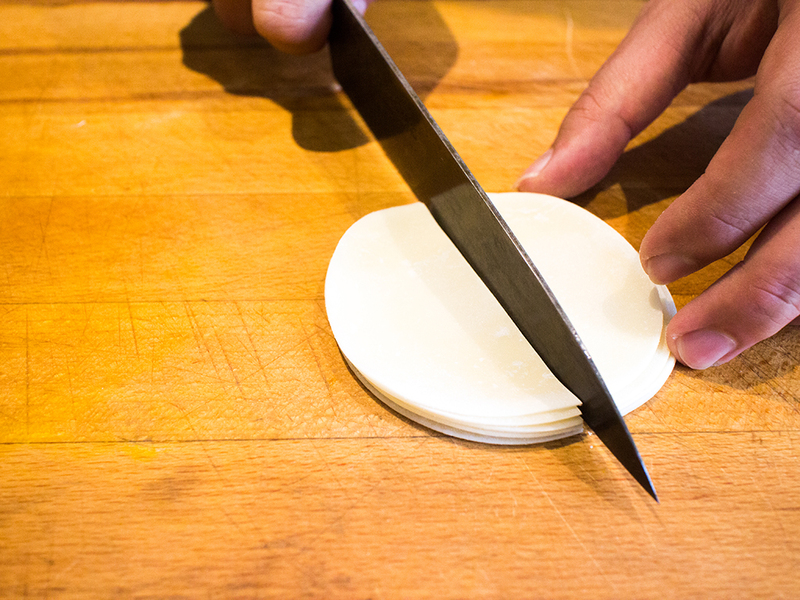 Using a mandolin with fine tooth blade, make a few test slices with your radish. You’ll want to cut it on the bias (diagonally), to get longer strands. Adjust the attachment placement until you get nice even strips of about 1mm. Don’t worry if your daikon ‘sticks’ together. You don’t have to peel them one by one to get individual strands. 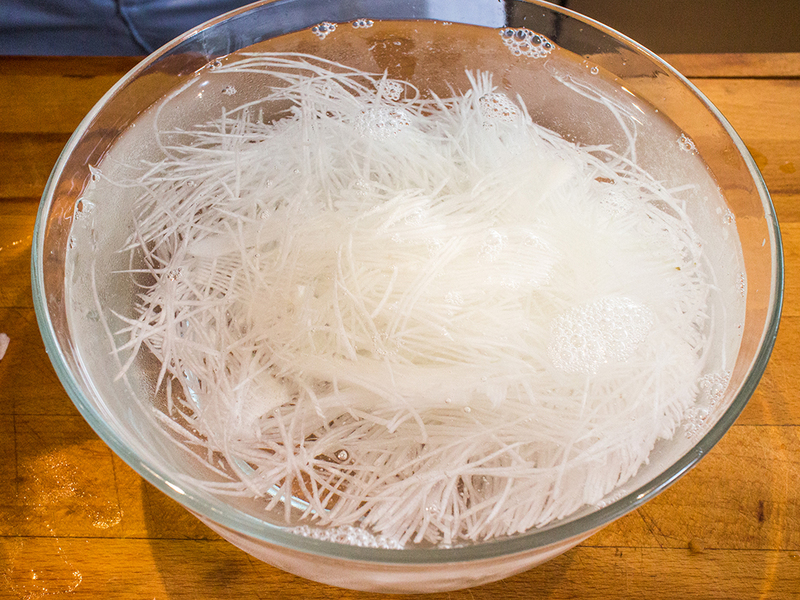 Instead, once you’re done slicing the radish, put the lot inside the water bath (it’s fine if the ice has melted) and the strands will naturally separate. There may be a few stubborn ones, so gently agitate the water with your fingers to spread the remaining radish strands. And when it goes into the water… magic! 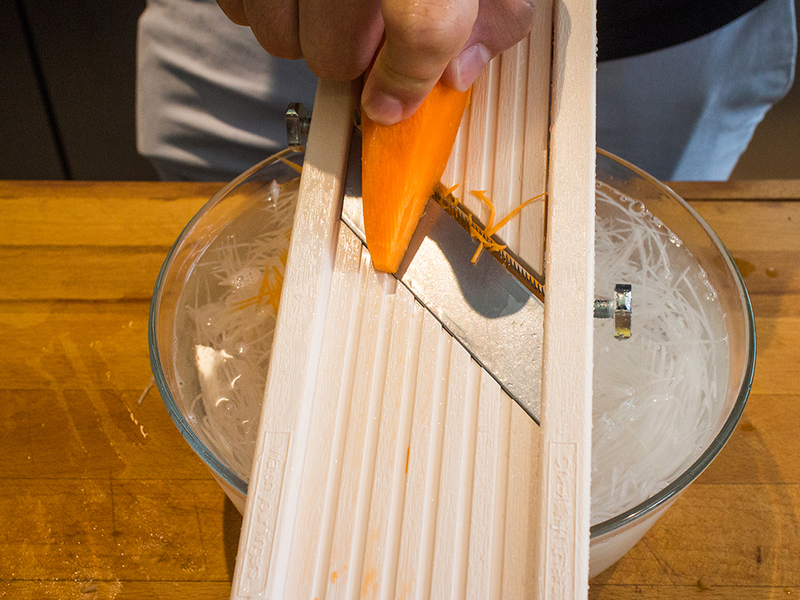 Use the mandolin to slice your carrot the same way. Add it to the same water bath and mix to distribute evenly. 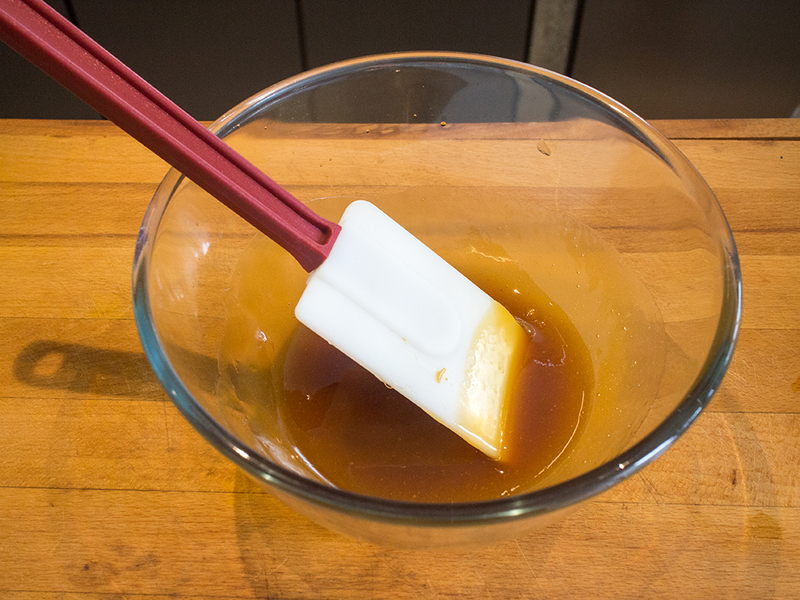 To make the dressing, add plum and shoyu sauce in a bowl and stir to mix thoroughly. Next, add olive oil and stir through. This thins the sauce. Add lemon zest and lemon juice and stir to combine. Have a taste. Your dressing should be tangy and sweet and make you want to lick the spoon. Different types of honey and lemons have different levels of sweetness and tartness, so feel free to add a little bit more of each until you get a flavour you really like. 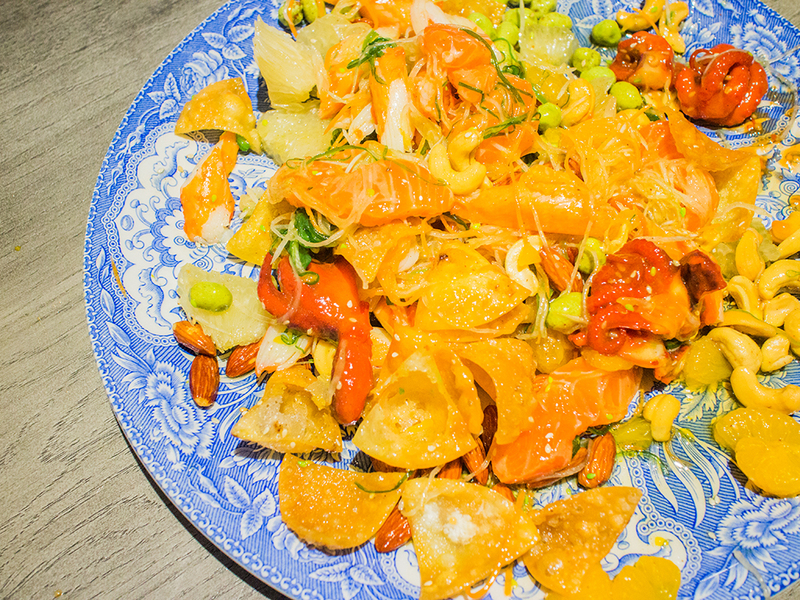 However, it’s important to keep the flavours balanced so it complements the rest of your yee sang ingredients. Serve dressing in a bowl or small jug. Slice gyoza sheets into 6 segments. You can stack a few sheets and slice them together. 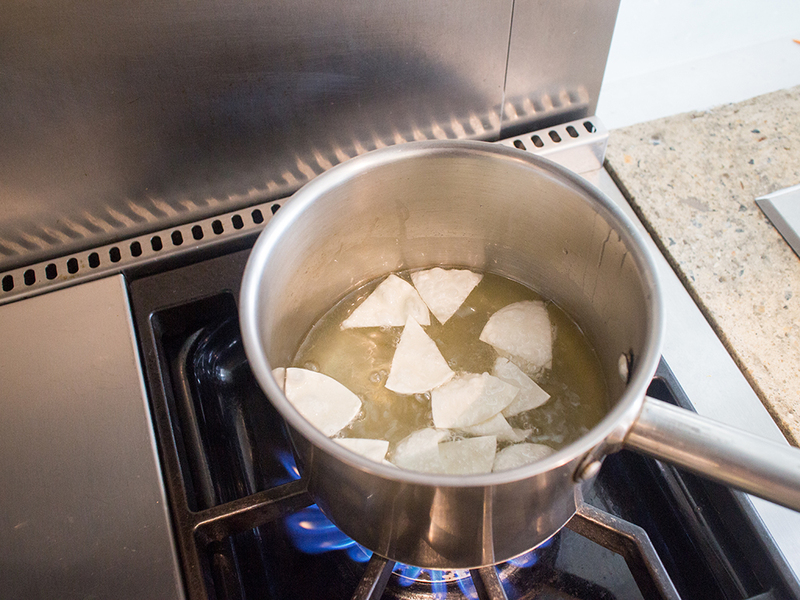 Fill a small pot with cooking oil about 2.5cm in depth and place it on your rangetop over high heat. Once oil is hot enough for frying, about 185°C, test with one piece of cut gyoza. Drop it into the hot oil. If it rises quickly and starts to crisp up, your oil is hot enough. If it doesn’t, let your oil heat for a few more minutes. Fry gyoza sheets in two or three batches. You’ll want a crunchy cracker that puffs up slightly and is a lovely golden brown in colour. It takes only about 1 minute or so. 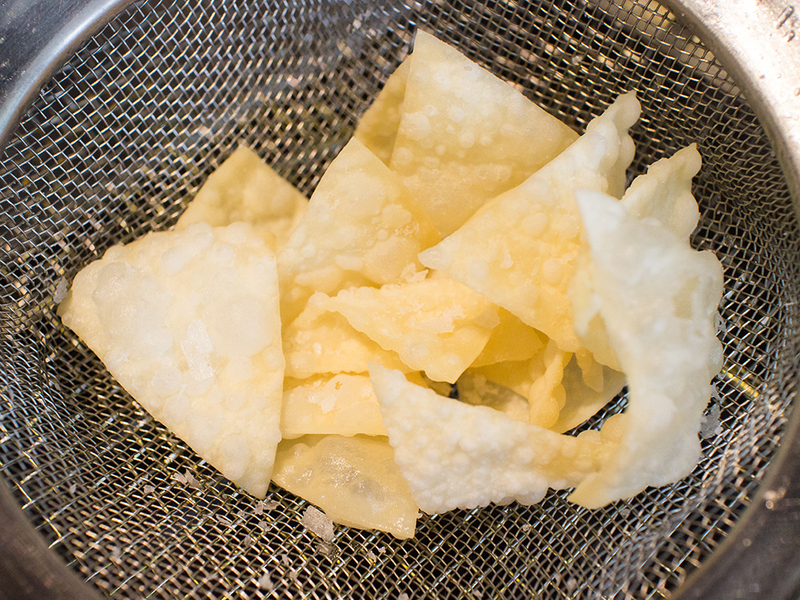 Transfer cooked gyoza to a colander and sprinkle with sea salt. Shake to distribute salt evenly. 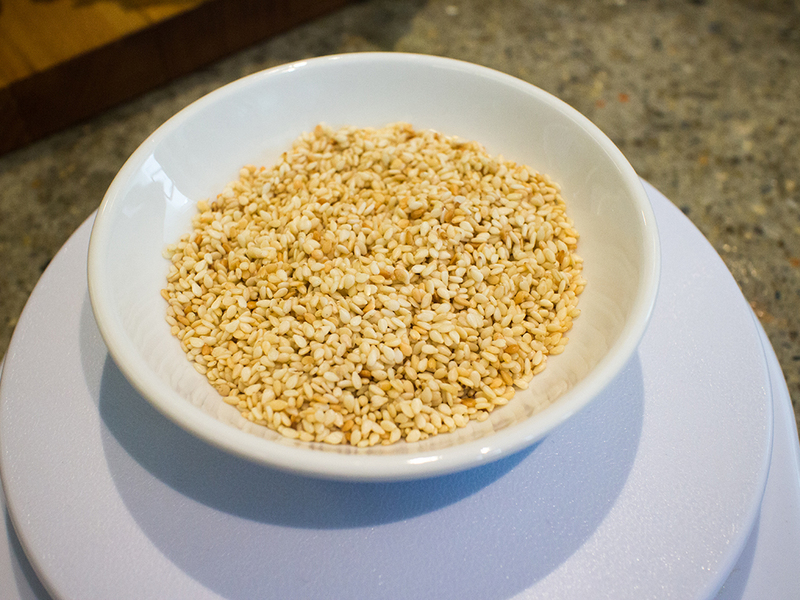 Move gyoza crackers to a bowl lined with kitchen towels to soak up excess oil. 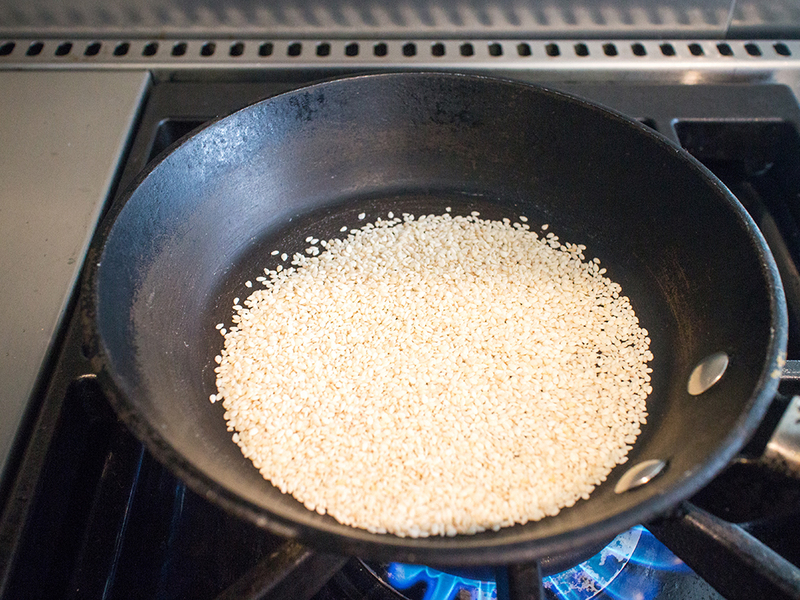 Heat a heavy bottomed pan on high heat and add sesame seeds. Toast until light brown, about 3 minutes. Don’t forget to continuously stir or shake the seeds so it doesn’t burn. Transfer about 2 tbsp into a small bowl. Reserve the rest for other recipes or more plates of yee sang. Peel pomelo and cut into segments, removing all the white parts. 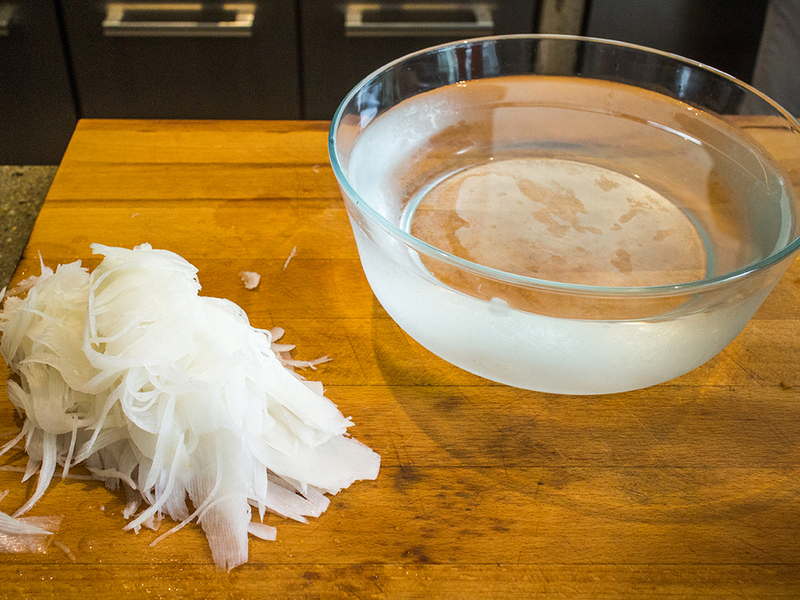 Break your pomelo flesh into bite-sized chunks. Cut cooked crab in half on the bias (horizontally). Slice octopus in half lengthwise, cutting from the head to the tentacles. 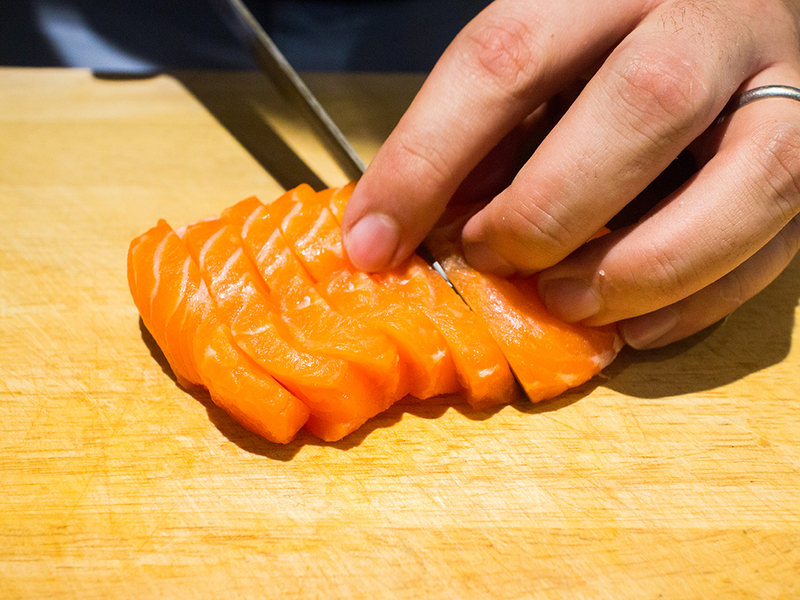 If you purchased a slab of sushi grade salmon, use a very sharp knife to carefully remove the skin. Sometimes embedded bones may be left in your slab of salmon. Use a pair of tweezers to remove it. Slice as thinly or thickly as you like, but since you’re making this at home, thicker slices add more texture and gives you a much better bite. 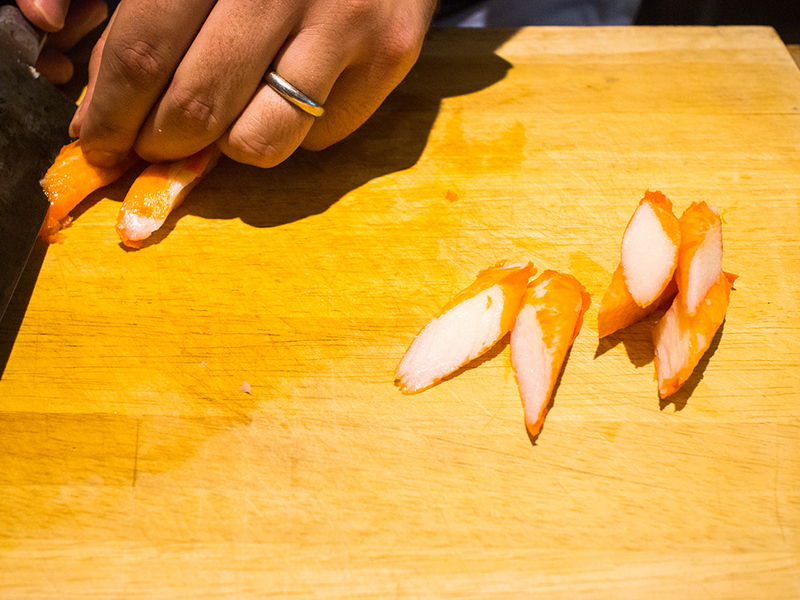 Fold sashimi slices in half and arrange in a funnel shape for easier transfer later. 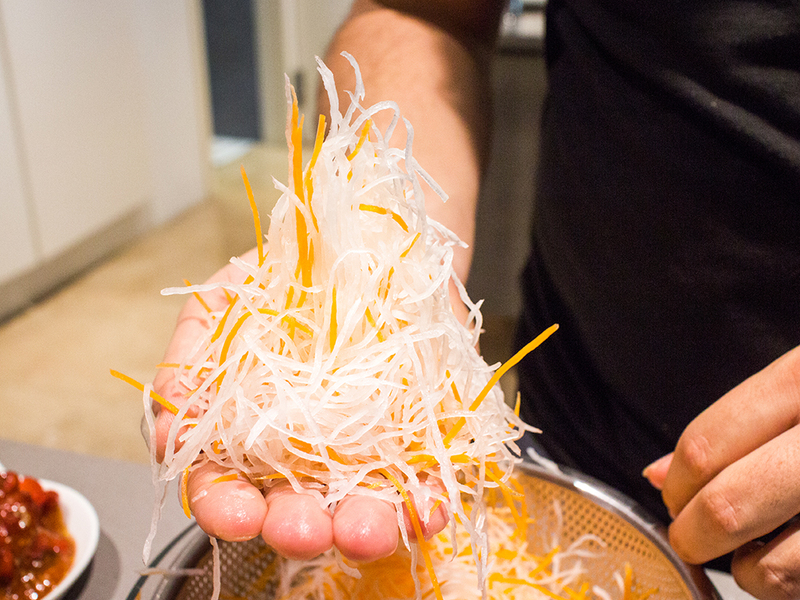 When you’re ready to assemble your yee sang, drain daikon radish and carrot strands. Shake to remove excess water. Get a really, really big plate out. It must be round. 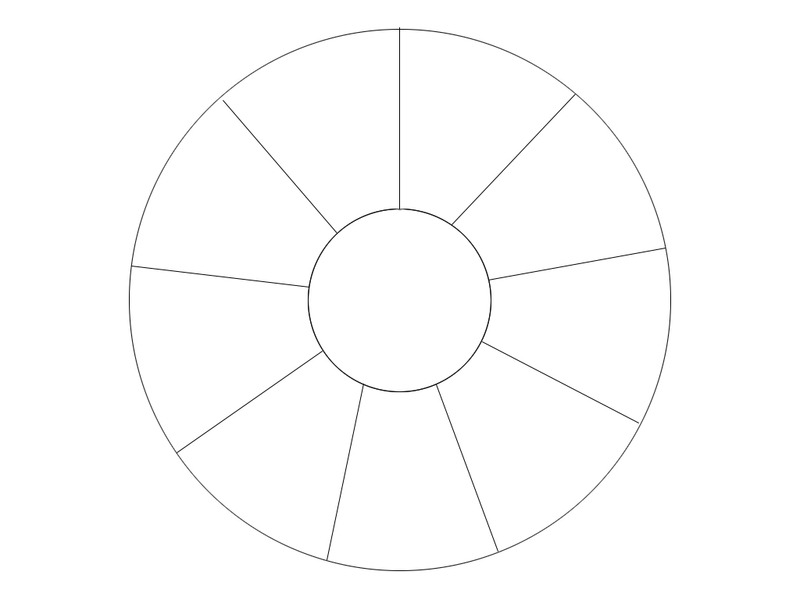 Mentally divide your plate into the segments as per the image below. The middle will be where you place your radish and carrots. Grab a fistful (or more) of radish and carrot strands and shape them into a mountain – you’ll want more radish with just a bit of carrot for colour. Place it in the middle of the plate. 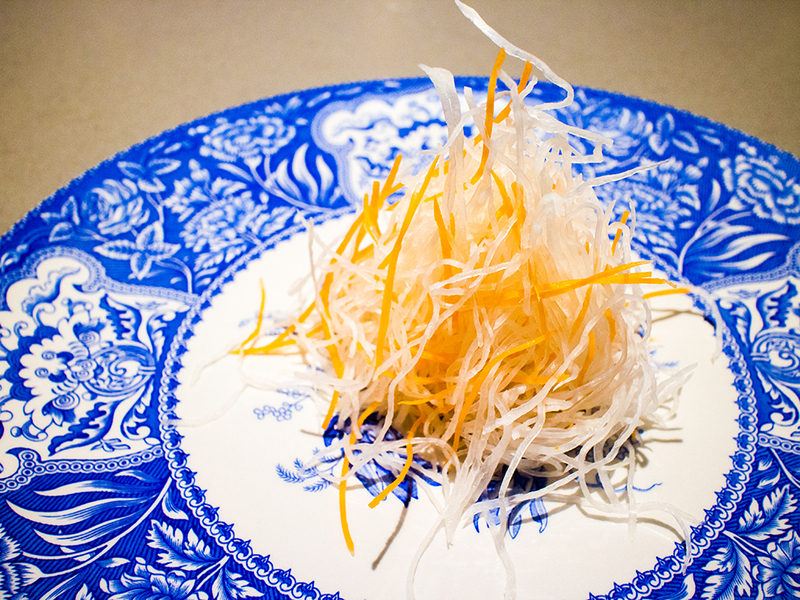 The yee sang is much like a salad, and the radish is the main component. It should take up the largest portion of the plate. Next, plate the nuts. Place almonds in one of the funnel segments, then skip two segments and place cashews. Finally, skip another two segments and place wasabi peanuts. Place the rest of your main ingredients – pomelo, orange, seaweed, crab legs, chuka idako and salmon – in the rest of the empty funnels. 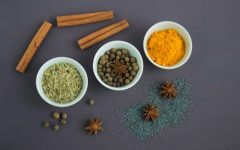 For visual pleasure, arrange ingredients next to another of a contrasting colour (as much as possible). Contrasting colours make for a visual feast! 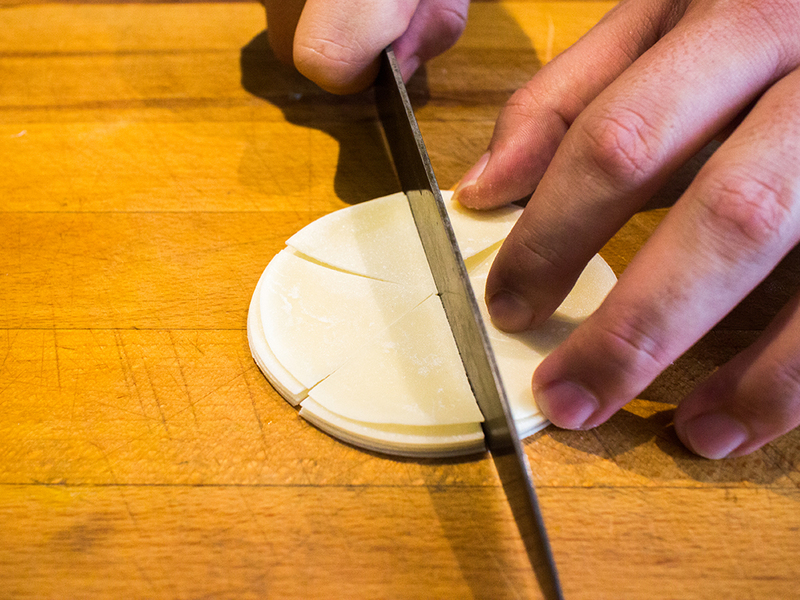 Finally, place a generous amount of gyoza crackers in a nice ring all around the radish. Your yee sang is ready to serve! Place olive oil in a bowl or small jug. Place five spice powder in a small bowl. Also place half a lime in a small bowl. Serve together with the dressing made earlier and your plate of yee sang. 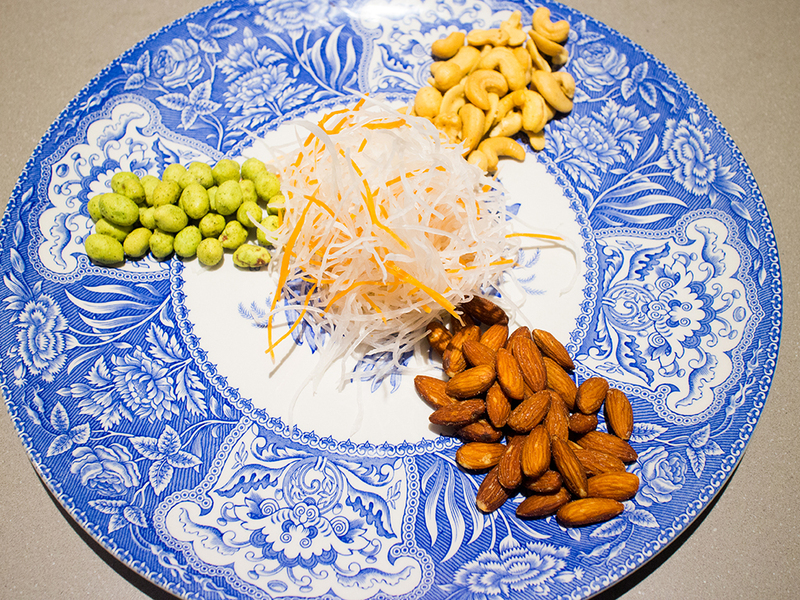 To eat, sprinkle toasted sesame seeds all over the prepared plate of yee sang. Then sprinkle five spice powder. Next, drizzle olive oil, followed by the dressing. 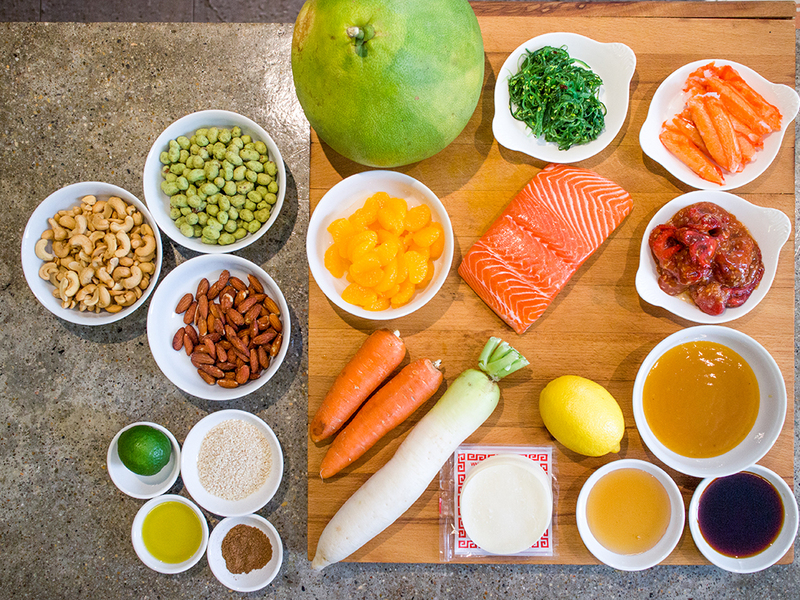 Finally, squeeze lime over the salmon. 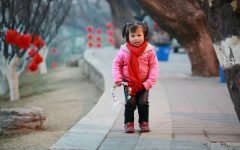 Grab your chopsticks and toss away while speaking your good wishes for the New Year. The messier it is, the higher you toss, the better your fortunes will be. Or so they say. You can use any 3 types of peanuts including candied walnuts, candied pecans or pine nuts. Hazelnuts have a distinct flavour, so it won’t go well with this recipe. 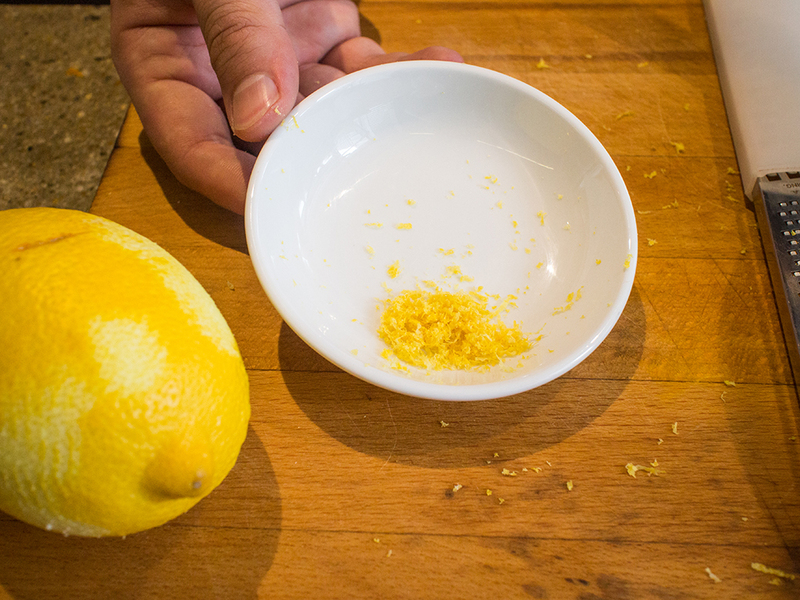 If you can get fresh yuzu, use it to replace lemon. It’ll take your yee sang to a whole other level. Sushi grade salmon needs to be handled properly. Always keep it in the chiller until it’s ready for use. Never use it past the recommended date/time as doing so can cause food poisoning. Furthermore, once the sushi reaches room temperature, it must be consumed within 4 hours. 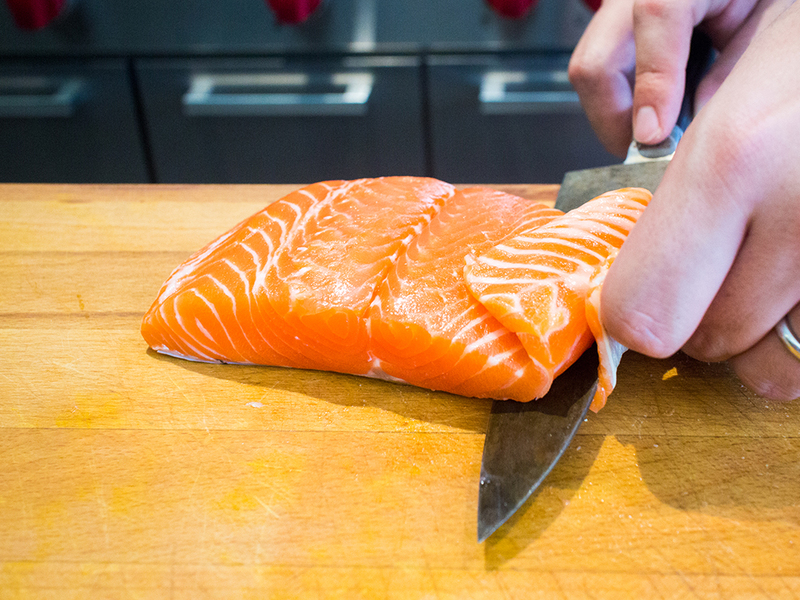 Buy your salmon the day you want to use it, but if you don’t eat in time, you don’t have to throw it out. 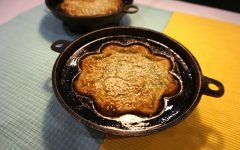 It is still safe to be cooked, as long as you don’t freeze it again. Look for peeled pomelos. It’ll make your life easier! 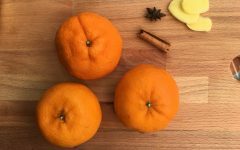 You can also use fresh mandarin oranges. 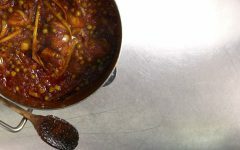 However, you’ll need to prepare them and soak them in pectin, so we recommend just using the canned variety. You can also make your own roasted nuts, but really, you’ve got so many other things that need doing! If you have the time, why not though? Most of the ingredients above can be prepared days in advance, and many don’t require any preparation at all. If you know you’re going to be busy, make what you can ahead of time and store as needed. 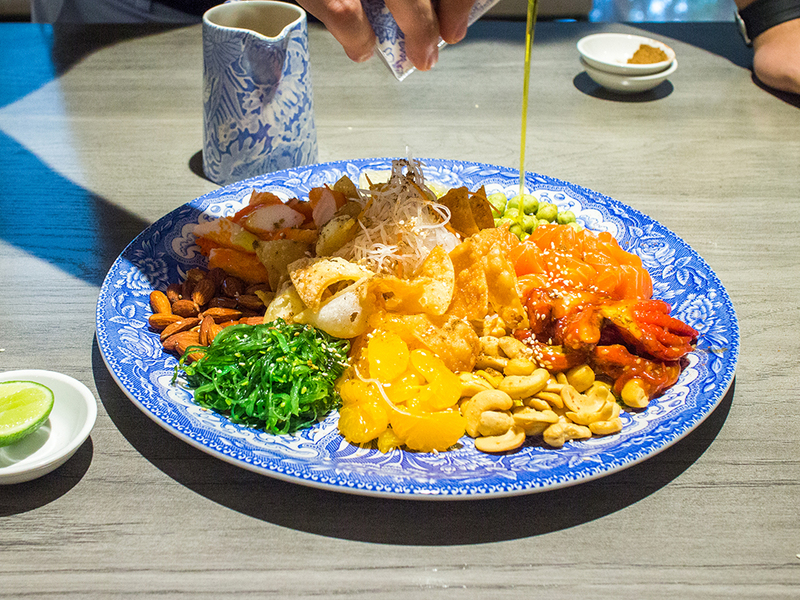 The measurements above are sufficient for one large plate of yee sang with a little extra on the side. However, we recommend making more as your guests will definitely want a second, and possibly third, helping. We got our crab legs, sushi grade salmon, chuka idako and seaweed salad from Focal Marketing Sdn Bhd in Kepong. You can also get your crab legs and salmon from other wholesale suppliers, Japanese restaurants or supermarkets like Isetan and Aeon. 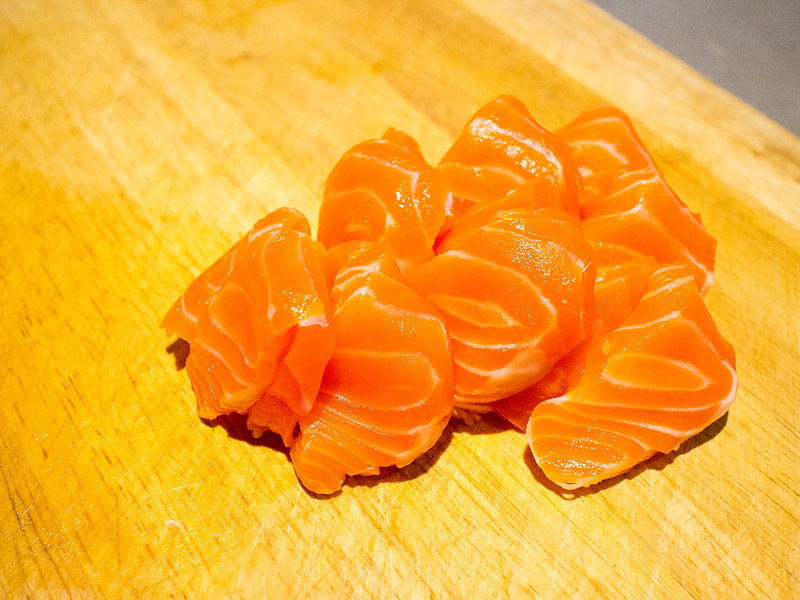 You can even get your salmon pre-sliced. Chuka idako and seaweed salad can also be purchased from your favourite Japanese restaurant as well as the Japanese section at supermarkets. All the other ingredients above can easily be found at your local supermarket. 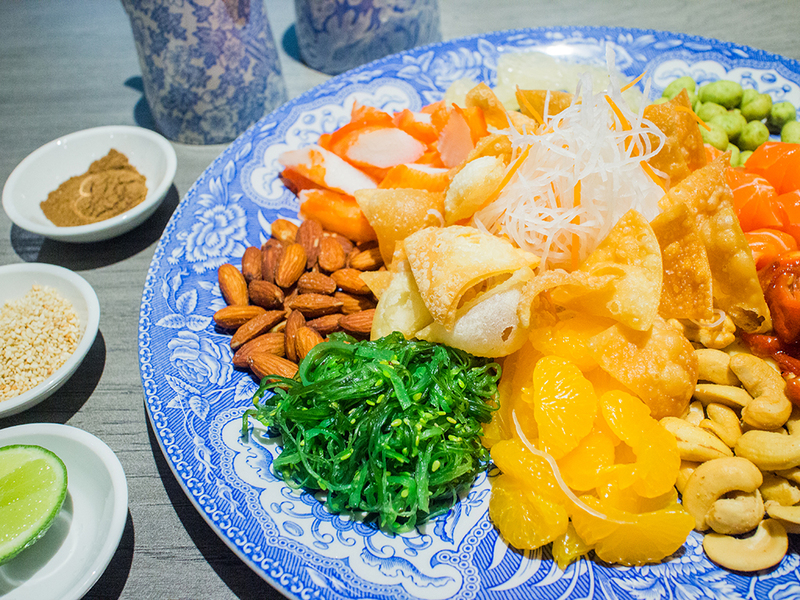 Will you take up the challenge to prepare a stunning plate of yee sang? Follow the instructions and it’s fail safe and absolutely Instragram-worthy. 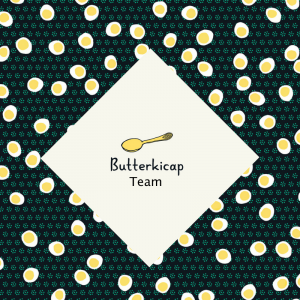 You’ve got to tag your pictures with #butterkicap so we can see how yours turned out. 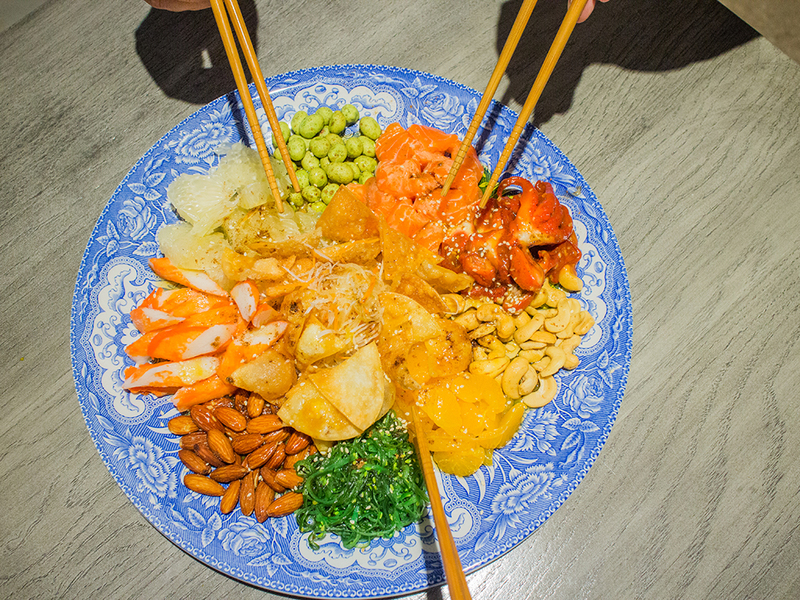 If you’d like to find out more about the history of yee sang in Malaysia, check out Where did Yee Sang Come From, Actually? 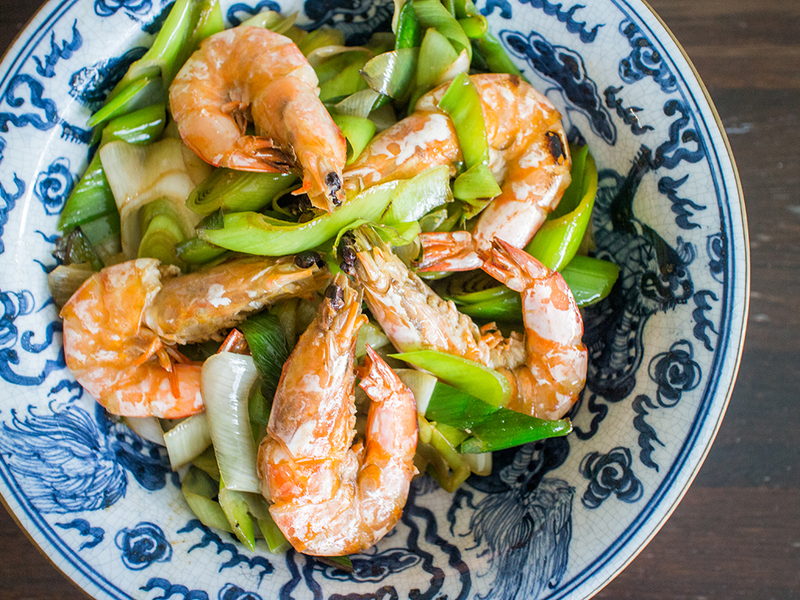 Stir-fry Leek with Prawns – an Easy Recipe for Good Fortune! 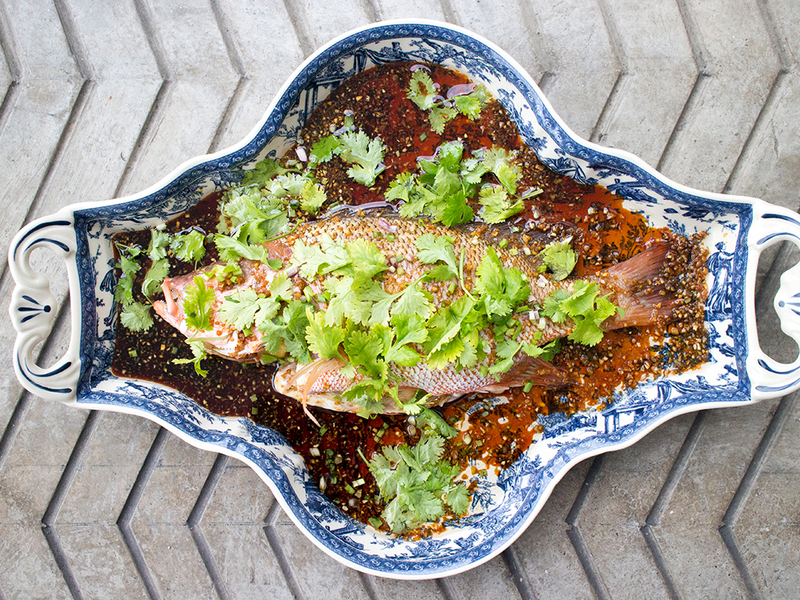 Incredibly Easy Hong Kong-style Steamed Fish Recipe!